I purchased a tug-no-more harness from you several months ago. I had been trying to find a way to walk my Lab for four years, since I had hurt my back. Two surgeries had not helped me to tolerate my strong dog's incessant pulling(dog training didn't help either). I had tried several other devices to stop her pulling including a halti(which she pulled on till the latch broke), and another device that put pressure on her front shoulders when she pulled(she wore through her hair and skin the first day). I attached the tug-no-more to a tracking harness so my dog wouldn't choke herself (which she had done with all the neck-type collars). It then took a few days for my back to get used to it, but because most of the pull centered on my hips, I was able to adjust to it. I now take my dog out for 10 to 15 miles a day and am planning a long, multi-day trip with a 25-30 mile/day average. Your invention has made my dog and me VERY happy! Feel free to post this on your website. I would recommend tug-no-more to anyone who asks--and I have! I just opened my parcel and the "tug-no-more" is just beautiful! I haven't yet taken my dogs for a walk with it because I just finished up work, but I did try it on and pranced around my office wearing it. hehe. I will report back when I get back from the walk. But my first impressions are extremely favorable. It feels great on and it's beautifully made and designed. I think it's very cool and I just love the poop pouch and the little plastic spoons. I will walk my dogs with it tomorrow afternoon through The Village, which is the heart of our little mountain resort town, and pass out the product sheets you gave me to interested parties. Thanks again Chris. I think you have a winner. I absolutely love my "Tug-no-More" leash system. I have taken my dogs for a walk with it 4 times since I got it and I am about to take them for a quick stroll after I send this off. It's so nice to not only be able to walk one of them without having my arms pulled out of my sockets, but I can walk both of them together with the harness system. As I mentioned before, I had pretty much quit taken them for daily walks and would take them running on my roller skates instead because it was just too much effort to walk them. Now I can easily walk them both and I don't have to fool around with getting their leashes out and having them tangled and all that. And the poop pouch is a fantastic feature. Not only is it great to hold the poop bags and of course the poop afterwards if their isn't a trash can close by, but it's big enough to hold one of those collapsible fabric bowls for water if we go on a long walk and of course other things like car keys, dog cookies, etc. I also found the little plastic spoons to come in very handy. I was walking the dogs with the leash system through our town's Village, and I stopped off to get a scoop of ice cream in a little cup and dropped my plastic spoon when we were crossing the street. I was thinking "oh crap" I'm going to have to go back to the ice cream shop for another spoon or just eat it with my fingers, then I remembered I had a plastic spoon in my poop pouch. he he he. It was very cool. 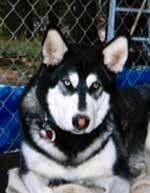 Here are photos of my 2 Siberian Huskies. As soon as I get some film for my camera I will have someone take some photos of us walking with the leash system and I will e-mail them to you. The black and white husky is named Blue and the little copper and white husky is Coco. They are both recycled dogs or rescues if you will. I prefer to call them recycled. They are both about 7 years old and I have had Blue for 5 years and Coco for 3. You can't tell from the photo I sent, but Blue is a massive animal. He weighs 132 lb.. and is nearly 6 ft. tall on his hind legs. He is bigger than I am and outweighs me as well. 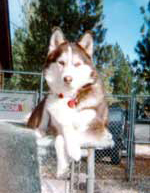 I call him the world's largest Siberian Husky and stick to that self given title until someone shows me a bigger one. Even though both of my dogs have been leash trained, it is still a workout to walk a Siberian Husky because of the nature of the breed. They were born and bred to want to pull and run and I live in the mountains where there is approximately 4 squirrels per block, scampering across the street in front of you. Dog sees squirrel, dog wants to chase squirrel. It's so much easier on my body to be able to hold them back when I'm wearing the harness than it is when I have a leash in each hand. Thanks again Chris. I love it. I will be in touch soon. I'm amazed that this product has been manufactured. Dont you agree that a dog pulling at all is a danger? How can you fasten a dog to any part of your body if he pulls? Your harness seems to elevate the hazard of a pulling dog. Why not train him not to pull. This is one of the easiest, yes..."easiest" problem behaviors to solve. Ive been training dogs for over 16 years, pulling is a big no no! Clearly a must not do while running. I can't beleive you feel this product is going to make it pleasurable, easier and less dangerous for us runners. Send your pulling dogs to me, within minutes they can be taught not to pull. I don't mean to sound so harsh, but this to me seems like a crazy invention..... Feel free to respond, hopefully I missed something in your add and you can tell me "I'm Crazy". Thanks for your comments! Nah... your not crazy. Your comments are classic comments that I have heard from other dog trainers. I couldn't agree with you more that people should get their dogs trained! Fortunately and unfortunately we have never formally trained our dogs. Unfortunately because I endured significant strain to my arms when walking or running them two years ago. Fortunately because the Tug-No-More evolved from my "problem". The interesting thing about using the harness system for the last two years is that my dogs have been trained by the routine of using the system. I run them five times a week, 5 miles each run, and they know that the harness system means we are running or walking the kids to school so they "know" the agenda. I now don't have the "pulling" issues that I did when I first started using the system. Now I use it because I can run without holding onto anything and the system does not conflict with my leg or arm running motion. The poop pouch is anchored to the leash lead and the leash extensions attached to the dogs do not tangle. Living in the suburbs we have leash laws so my dogs must be tethered. "Don't you agree that a dog pulling at all is a danger?" Sure! A dog pulling could be a danger and at several dog trade shows I have attended, four specific customers verified that statement after they dislocated their shoulders from their pulling pooches on a regular leash. Can a dog pull you down using Tug-No-More? Sure! Size & weight of the person, size, weight and quantity of dogs are all variables in whether Tug-No-More is appropriate for an individual. We don't recommend kids to wear the harness and our instructions talk about characteristics of the owner and dogs are important. We are excited because we just finished prototyping a specially designed "quick release" that we are having manufactured. It releases the leash lead from the harness ring. All harness systems will come with this release. It is an additional feature that the individual can use if they run into an unexpected circumstance. All existing customers will have the opportunity to get the release if they want. "How can you fasten a dog to any part of your body if he pulls?" Your harness seems to elevate the hazard of a pulling dog. No, it really doesn't. That comment won't hold much weight for you though. You would need to test the harness system yourself to make your own judgement. For many, pulling is not an issue. Tug-No-More has been a friend for many trainers because it alleviates having to hold onto anything when leash laws require a leash. I hope my comments help clarify and answer your questions. The harness system evolved from an idea and from "rigging" some straps around my waist to solve a problem. Two years later we are constantly modifying and improving the system. We encourage the good, bad and ugly comments from everyone. It is important to listen to our customers (their comments and suggestions). It is also very important to listen to our critics because it helps us to become even better! I am REALLY interested in trying out this product but based upon your return policy, if I try it & don't like the way it works I am stuck. would love to see a video of someone actully running with a dog using this system. I feel certain that would convince me. Do you have one to put on your website? The old lady video is great; maybe you could add it to that somehow. I look forward to hearing back from you. Thanks. Hi Karen! Thanks for your email! I have no problem with having you try the harness and if you don't like it you can send it back for a full refund. I just wanted to let you know how much I LOVE Tug-No-More!!! I've been running with my 80 pound Akita mix for a couple years now, and although I've continued to take him (mainly because he loves running so much) I was actually starting to 'dread' my runs because of the almost impossibility of keeping him under control with a hand-held leash, and also because of the constant feeling that he was going to pull me head first down the road at any minute. As you know I was hesitant to try Tug-No-More just because it seemed very different. But by the time I reached the end of my street I was smiling ear to ear! I really enjoy running with my dog again! Because I have more strength through my center, I can actually control him, without the fear of toppling over. Thanks again! Thank you for letting me to "test drive" the Tug-No-More System. "Tyrone" and I thoroughly enjoyed our experience with it. The design of this product affords the walker with far greater freedom of movement and an ergonomically more human-friendly pet control than a standard leash. Runners and cross-country skiers will love these features. Those using this device for "city driving" might benefit from combining its use with a head halter (e.g., Gentle Leader, Halti) for their dog. I appreciate the opportunity to participate in the development of this product. I am sure those who use it will be pleased with how well Tug-No-More works. "Thanks Chris, we received your harness in the mail yesterday and tried it out on an evening walk. I have to say, I do not think I will be using a traditional leash again. I will spread the word. I think it is a fabulous product." "We've both used it with great success. I can actually walk the dogs on a flat buckle collar without having them panting from pulling. Trudy had three weimaraners on it, so that's enough said!"